Take the guesswork out of your kitchen remodel with our foolproof guide to determining the perfect countertop height for comfort and ease of use. Q: I’m putting in a new kitchen. What’s the right height for the countertops? A: Well, depends if you want the short answer or the long one. There is an industry standard countertop height recommended by professional installers that can be comfortably reached by people of average height from a standing position without bending over. While this suits most folks for food prep, you might need to adjust the height of your countertops if they’ll be used for unique purposes or by people with special needs. Once you’ve settled on a height, select cabinets, countertop materials, and appliances that accommodate it. 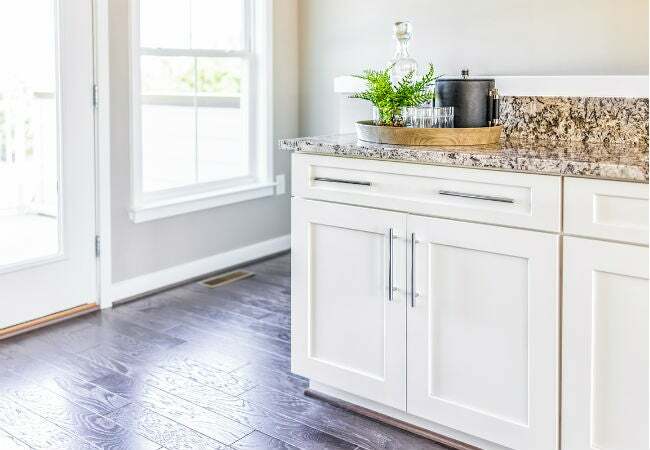 Read on to learn the correct countertop height for your household, as well as must-know installation info, so your new kitchen will function beautifully for everyone. The average countertop height is 36 inches above the floor. The distance from the floor to the countertop work surface should measure 36 inches, according to the American National Standards Institute/Kitchen Manufacturers of America. This countertop height factors in a base cabinet height of 34½ inches plus a 1½-inch-thick countertop. That 36-inch height is also suitable if you’ll be mounting countertops directly to a wall with braces and no cabinets below. Increase the height to 42 inches above the floor for a bar-height countertop. Bar-height countertops, also known as pub tables, should be positioned 42 inches off the ground (making the base cabinet height 40½ inches off the ground). This height lets you comfortably place beverages on the bar from either a standing or a seated position. The 42-inch height factors in the 29- to 32-inch height of standard bar stools plus a clearance of 10 to 13 inches from the top of the stool seat to the countertop. 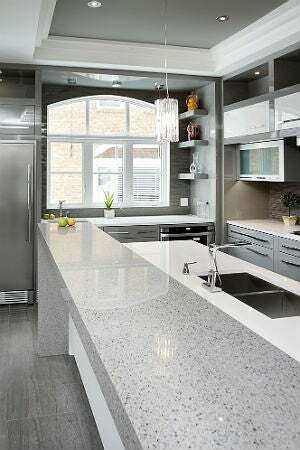 Decrease the countertop height to between 28 to 34 inches above the floor to accommodate those with limited mobility. Standards set by the Americans with Disabilities Act state that a countertop height range from 28 to 34 inches will allow individuals who use a wheelchair to easily pull up to the work surface. Base cabinet height would need to be adjusted to between 26½ to 30½ inches above the floor accordingly. Select countertop material thickness accordingly. Keep in mind that not all countertop materials are sold in the 1½-inch thickness assumed in the 36-inch standard countertop height. For example, 1½-inch-thick butcher block countertops are readily available on the market, but granite, marble, and quartz slabs are most commonly sold in a two- or three-cm thickness (roughly ¾-inch-thick and 1¼-inch-thick, respectively). To increase the overall countertop thickness to 1½-inches when using thinner stone slabs, your countertop installer will lay a foundation of wood “buildup” strips on top of the base cabinets and then install the slab on top. The thickness of the buildup strips and countertop material should together add up to 1½ inches. For example, a ¾-inch-thick quartz slab can be laid over ¾-inch-thick buildup strips to achieve the desired thickness. Choose appropriately sized cabinets and toe kicks. Most pre-built base cabinets already conform to the 34-inch-tall height standard, which factors in a cabinet height of 31 inches and a “toe kick” area (between the cabinet and the floor) of 3½ inches. If you’re building your own base cabinets to conform to the 34-inch height standard, ensure that they measure 31 inches tall, then allocate a clearance of 3½ inches from the floor to the bottom of the cabinet. Avoid increasing the height of the toe kick, as this will diminish the height of the cabinets and leave you with less storage space. Ensure countertops are deep enough to protect your base cabinets. The standard depth of base cabinets is 24 inches, but the depth of your countertops should be 25 inches when installed. The one-inch overhang is recommended to protect your base cabinets from debris and spills that may fall from the countertop. Pick appropriately sized appliances. When shopping for a built-in dishwasher, rule out models with a cut-out height (the height of the opening in the cabinet where the dishwasher will go) that’s higher than the height of your base cabinets. 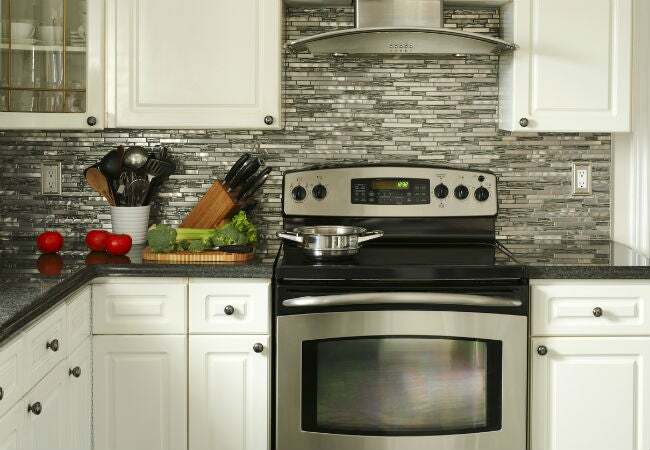 For electric and gas ranges, opt for models that are the same height as your countertop so that the top of the stovetop sits level with the countertops on either side of the range (e.g., a 36-inch-tall range for a 36-inch standard countertop height). Install cabinets and countertops correctly. If DIY-ing cabinet and countertop installation (which is not recommended for heavy materials like granite or quartz), measure the desired base cabinet height from the floor, mark the height on the wall, and install the cabinets so that the tops of the cabinets line up with the mark. Next, attach the buildup strips with screws to the top of the base cabinets if necessary. Then, depending on the material, attach the countertop to the buildup strips with construction adhesive or screws. Your countertops should now stand at the perfect height!